It’s my favorite time of year! The delicious food, fashion, and gorgeous colors all put a big smile on my face and fill me with joy. I know my maple cinnamon butternut squash with bacon roasted brussels sprouts will be a wonderful addition to your Thanksgiving Day table and will garner rave reviews from friends and family. And for the next several weeks, I’ll be showcasing my favorite healthy holiday recipes for you to enjoy. Butternut squash is perfect for all biotypes. It’s high in fiber, potassium, and vitamin B6, an important nutrient that supports the brain and proper functioning of both the nervous and immune systems. It’s a nutrient I recommend a lot in my protocols, too. Brussels sprouts also support digestive health and when steamed, provide cholesterol-lowering benefits due to their ability to bind to bile acids for easier excretion. 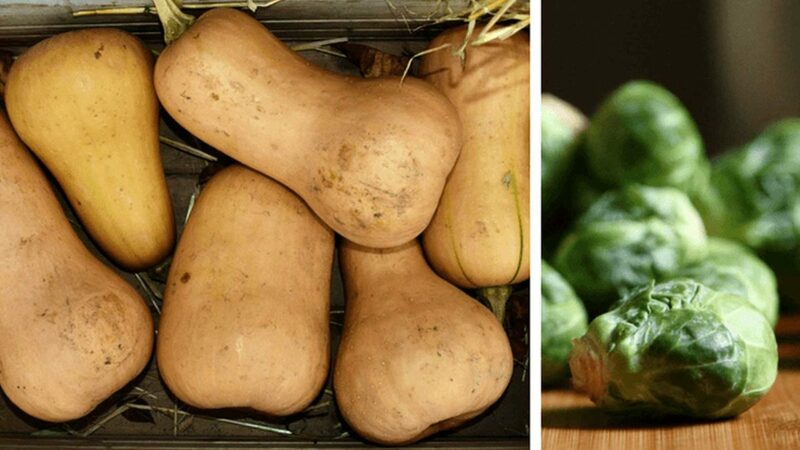 A member of the cruciferous family of vegetables, they contain specific glucosinolates: glucoraphanin, glucobrassicin, sinigrin, and gluconasturtiian. Glucosinolates are natural components of many pungent and sulfur-rich plants that protect them from predators, which is why they must be cooked prior to consumption. They contain a higher folate content, so enjoy them in moderation if you are undermethylated. And don’t buy into claims that they fight cancer for everyone. Folic acid actually contributes to cancer in those of us that are undermethylated. Preheat oven to 400 F. Line a large baking sheet with parchment paper. In a medium bowl, combine brussels sprouts, 2 tablespoons olive oil or ghee, and a sprinkle of salt to taste, and toss to combine. Place on baking sheet, cut side down, and roast in the oven at 400 F for about 20-25 minutes. During the last 5-10 minutes of roasting, turn them over for even browning. In a medium bowl, combine cubed butternut squash with 1 tablespoon olive oil or ghee, maple syrup, and cinnamon, and toss to mix. Place butternut squash in a single layer on the baking sheet. Bake for 20-25 minutes. I recommend roasting them on two separate baking sheets at the same time, on the two racks in your oven. They will roast more evenly because they will not be overly crowded. In a large bowl, combine roasted brussels sprouts, roasted butternut squash, bacon, pecans, and cranberries, and mix to combine. Let me know how this side dish turns out for you in the comments below! Folic acid works in different ways in different parts of the cell. The part we need to be concerned about is the nucleus because it’s inside the cell that we see methyl loss, and folic acid strips more methyl than it provides. Researchers involved in the treatment of cancer now realize that folic acid is directly related to an increase in cancer rates. Methotrexate, a drug used to treat cancer, acts by inhibiting the metabolism of folic acid. It’s a great cancer agent, but unfortunately, patient’s got worse and many died because folic acid was added back in. This is a good indicator as to why undermethylated persons have a greater propensity to develop cancer and do worse on folates. Read more about it here. Thank you! This sounds amazing! I have read that you should avoid bacon as it has high amounts of copper? Is it ok to eat bacon if it’s uncurled? Cured products are high in copper. Uncured bacon is safe.